FotoBella: Share a wish list to win a eCraft! 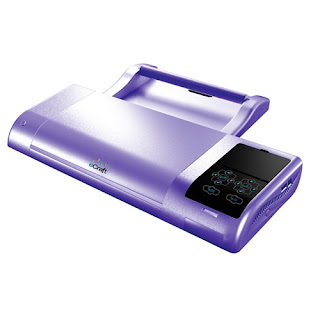 Create your wish list for FotoBella.com and be entered to win your own eCraft Electronic Craft Cutter! Entering is simple! Just browse the FotoBella website, find the items you would love to have, add it to your wish list, then share your wish list on FaceBook. You will receive one entry for each item you add to your wish list and share on FaceBook. Entries must be received by December 9, 2012. The winner will be picked at random on December 10, 2012. Below you can see where you will find buttons to add to your Wish List when looking at any product on the FotoBella site. FotoBella integrates with TWO Wish List sites, WishPot.com and MyRegistry.com. (We have had some customers who have had trouble with WishPot, who requested we add MyRegistry). When you click the "add to MyRegistry" button, you will be prompted to login to MyRegistry.com and add the item to your wish list. (Don't worry, if you don't have a MyRegistry account, it is easy to create one!). Make sure that you have "Publish this gift to my Facebook wall" checked, and then click "add to my Registry! 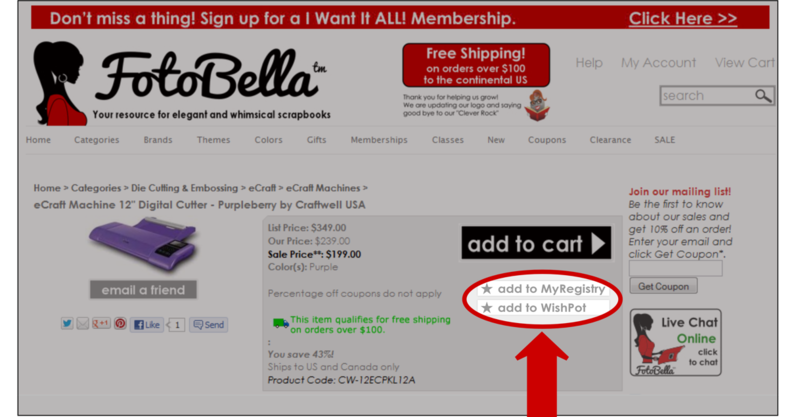 If you click the "add to WishPot" button, you will be prompted to login to WishPot.com and add the item to your wish list, make sure to have the "Facebook Share: On". Then click "Add". Both of these Wish List engines let you create a list from all your favorite stores, so sharing what you want is EASY! Add as many items as you want from FotoBella, and for each item you add to your Wish List, you will get an entry to win, the next generation of electronic cutters... It's that easy! Craftwell is proud to bring you eCraft, the revolutionary electronic cutting system that is easy to use, fun and fast. It is ideal for scrapbooking, paper crafting, home décor, making cards, banners and so much more. This is the latest version of the eCraft machine with version 2 of the firmware. The eCraft's unique design and paper feeder system make it easy to cut materials automatically, without the use of a cutting mat or the need for manual adjustments. Use the Paper Tray to stack multiple sheets at a time, or use the Roller to cut 12" by ANY length. The eCraft is ultra slim and its lightweight design lets you take it anywhere. Use it on its own or attached to a computer. With its easy to use software and large selection of fonts, shapes and designs, anyone can be an expert in minutes. Making great looking designs and projects has never been easier! The eCraft comes in several models, all with the same great cutting capabilities. The eCraft comes in 4 beautiful colors, Skye Blue, Pinc, Purpleberry, and Glacier White. Each comes equipped with a 2.8" B&W display, paper tray with built-in roller, Image Card Fundamentals 1, two black pens and five blades. Once you register your machine you will be able to download eCraft software for Free! The eCraft now also works with Makethe Cut and SureCuts a Lot. Along with the eCraft, the winner will also receive a coupon for 15% off eCraft supplies purchased from FotoBella. Many thanks to Craftwell USA for sponsoring this great give-away!